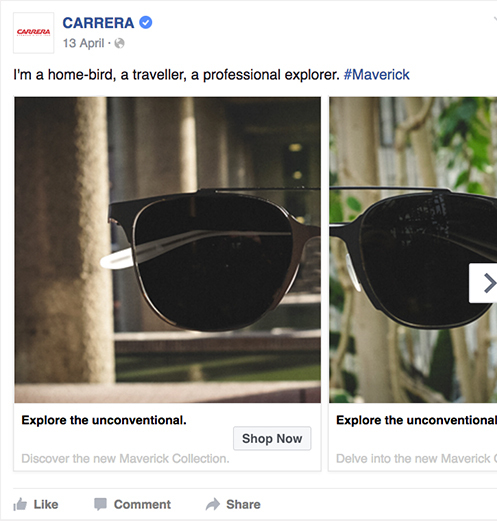 Our social campaign to promote Carrera’s new Maverick range of sunglasses centred around the definition of the word ‘Maverick’ - a free spirit, an original, someone not easily pigeon holed but rather someone who embraces all the contradictions that life offers. Jared Leto, the face of the campaign, perfectly embodies all those attributes. Tasked with increasing sales and building product awareness in the UK, we used innovative content across key social platforms. 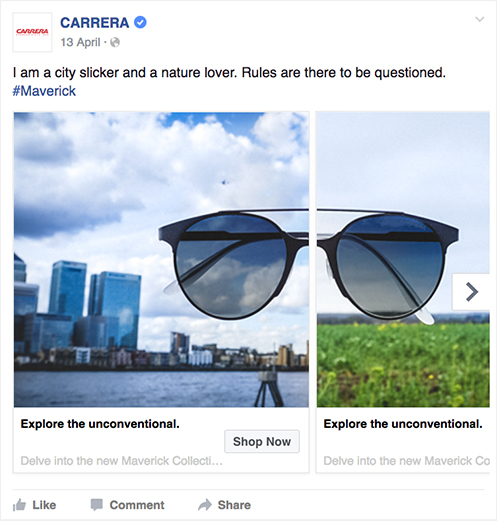 We didn’t want to just tell consumers what makes a maverick, we wanted to show them. To reinforce the campaign messaging we created a catalogue of images. Each image was one half of a pair, together the pair revealed the full frame of the sunglasses. To drive home the duality of a maverick and the diversity of personalities that wear the product; the pairings had contrasting locations, textures and subject matter. 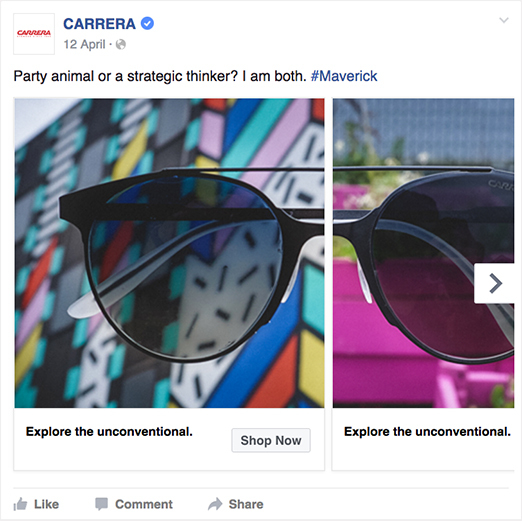 Used as carousel posts on Facebook, we introduced the two sides to our fictitious mavericks and posed questions back onto the audience, “Party animal or strategic thinker?”, sparking thought in viewers mind, perhaps they’re both and maverick themselves! 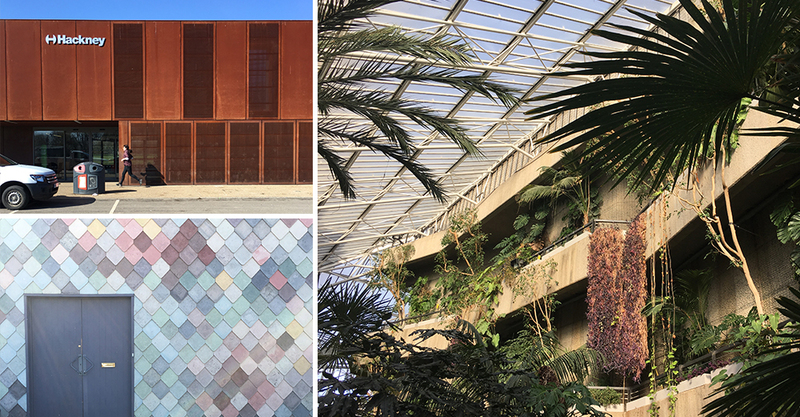 The series explored 16 unusual and striking locations around East London to help capture a breadth of visual duality in our mavericks. 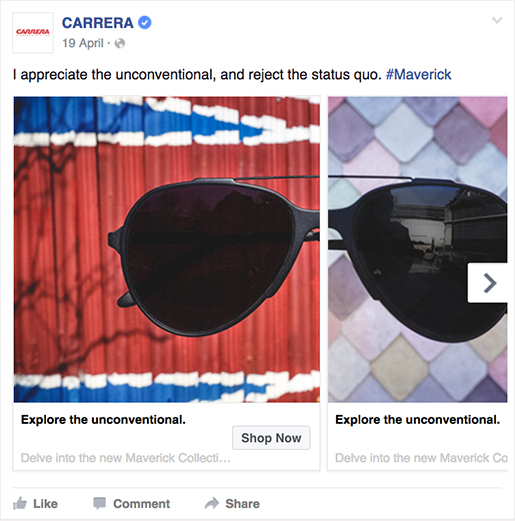 Once the idea of the Carrera #Maverick had been planted into the mind of the audience targeted posts and ads were employed to call fans to join a project and work alongside spokesman Jared Leto, to create the latest Carrera campaign video. Ahead of shooting the dual product images, our needed to find a diverse range of locations representing a wide array of hobbies and interests; preferably locations that really exemplified the range of personalities and character traits to our mavericks. With the plan to shoot the whole series within a day, the team at Catch went about scouting locations and venues. The result; a 2.5mile radius walking tour of some of the more unusual sights and sounds that east London had to offer.